Added on February 6, 2018 by JETAA Southeast. YES, JETAASE will be hosting our very own JET 30th Reunion event! If you missed the JET30 Reunion held at Washington D.C. but REALLY wanted to go, or if you want to reminisce about life on JET, or if you just want to hang out with other cool JETS and have a blast, this is the chance! Added on March 1, 2017 by JETAA Southeast. Ready for some sakura? Join us for the 3rd annual JETAA and Southern Bridge International hanami picnic! Meet other JET alumni and Japanese expat families in the Triangle while enjoying a natsukashii picnic under the sakura. And we have an exciting addition to this year's picnic thanks to the generosity of the Consulate General of Japan - Atlanta! We're working with Kidokinetics to have a lively undokai (aka sports day) as part of the festivities. Relive your glory days on the Japanese school yard with relay races, dancing, and more! Please email sbi@southernbridgeintl.org with how many people will be joining you at the hanami. We'll be using this headcount when planning the undokai activities and also for providing drinks and snacks (we recommend packing a lunch to bring as well). Added on February 6, 2017 by JETAA Southeast. JETAASE is having its biannual officer elections this year. All JETAASE members are eligible to run for open positions. Whether or not you're interested in running, please carefully read and follow the election process as described below. The Secretary shall attend all meetings of the Board of Directors and shall record the proceedings of such meetings in books to be kept for that purpose and shall perform like duties for any committee of Directors when required. The Secretary shall ensure that the minutes of each meeting of the Board of Directors are distributed to each Director. The Secretary shall give, or cause to be given, notice of all meetings and shall perform such duties as will be prescribed by the Board of Directors or the President. The Secretary shall have custody of the corporate seal of the Corporation, and shall have authority to affix it to any instrument requiring it, and when so affixed it will be attested by the Secretary's signature. The Education Chair plans education-related activities the chapter is involved in, such as Japanese classes, etc. The Education Chair leads JET recruiting activities organized by JETAASE. February 27th, 2017: Self nominations will be due via email to jetaase@yahoo.com. Your nomination should include your reason(s) for running and a short self-bio relating to JET and Japan. March 6th-8th, 2017: JETAASE members will be able to submit ballots during the three day voting period. All JETAASE members will receive a voting form link by email. The election results will be posted in a future JETAASE newsletter. JETAASE is looking for a subchapter representative for Alabama. If you are interested in this position or would like more information, please contact us. For those who are not interested in being an officer, we are seeking members who can assist the board with event planning. If you are interested in championing and planning a JETAASE event, please contact us. You do NOT need to be residing in the metro Atlanta area to plan an event! Added on February 19, 2016 by JETAA Southeast. Join the 2016 Regional Conference Delegates at the Nijikai on Friday, February 26th at the Georgia Aquarium. We will arrive at 8:15pm. Hope to see you there! JETAASE has set up a fabulous event to visit the Georgia Aquarium after hours while enjoying cocktails, tapas and entertainment. In order to attend this event you MUST pre-pay by MONDAY 2/22 at 5pm EST. Click here to register. Added on September 25, 2015 by JETAA Southeast. Added on July 9, 2015 by JETAA Southeast. JETAASE would like to extend an invitation to JET Alumni and Departing JETs to meet for southern cooking at Folks restaurant at Folks on 4286 Lavista Road, next Thursday the 16th starting at 7:00. It may well be the last chance some of these departing JETs get to have real southern cooking for a while. Added on February 6, 2015 by JETAA Southeast. Volunteer Opportunity! The organizers of this year's Japan Academic Challenge are again looking for 1-2 JETAA volunteers to assist in judging the competitions. The commitment would be for a full day on Saturday, March 7 at Kennesaw State University. The Japan Academic Challenge is a high school team competition which will challenge students’ knowledge of Japanese cultural aspects, including: history, geography, language, and current events. For more information, please visit this website: http://www.atlanta.us.emb-japan.go.jp/JACJSP2015.html. If you are interested and available, please contact Mellissa at mellissa.takeuchi@aa.mofa.go.jp. Added on January 3, 2015 by JETAA Southeast. Kyle Munn, a JET alumna living in North Carolina, notes several new or soon-to-be-opened restaurants in NC that are worth checking out. Dashi is a ramen shop and izakaya in downtown Durham. It is opening in early-January. I was lucky enough to go to a tasting a few weeks ago and the ramen in very good. Definitely not the instant soup stuff a lot of places around here try to pass off! A fellow JETAA told me about this place they checked out while in Asheville a couple months ago. A real live sake brewery in the mountains of NC. Between this place and the wasabi farm out there it's starting to turn into Little Japan. The Japan Center is still accepting registrations for their spring Japanese lessons. Classes range from beginning level to JLPT preparation courses with classes for adults and children. Added on November 9, 2014 by JETAA Southeast. According to a Daily Yomiuri article, the Japanese government plans to increase JET Programme participants by 2,300 between 2015 and 2019 with an eye towards eventually increasing the program to 20,000. This seems to be in line with LDP policies announced back in April. Read an English version of the article over at Jetwit.com! Added on October 29, 2014 by JETAA Southeast. "[T]he IUC (Inter-University Center for Japanese Language Studies) is one of the leading Japanese language institute for highest level of Japanese. Since 2013, the Nippon Foundation has offered fellowships to 10 promising graduate students of Japan Studies doctorate courses in the US, who participated 10 months Japanese language training course in Yokohama. If you have any questions, please contact IUC secretariat: iucjapan@stanford.edu." Plans announced to place ALT's in all primary schools in Japan! Added on September 24, 2014 by JETAA Southeast. The government has decided to increase the number of Assistant Language Teachers considerably over a five-year period, starting from the next school year, to strengthen English education at primary schools. Aiming to create a system in which ALTs will be assigned to all public primary schools by the 2019 school year, the Education, Culture, Sports, Science and Technology Ministry, the Internal Affairs and Communications Ministry and the Foreign Ministry plan to increase the number of ALTs by about 2,300 over five years as a national project. Combined with ALTs who are hired independently by municipalities, the ministries intend to expand the total number of ALTs to 20,000, or 1.5 times the current level, by the 2019 school year. The education ministry has decided to lower the starting age for English education from the current fifth year of primary school to the third year by the 2020 school year, and make it an official subject from the fifth year. Experts have said it is important to secure a sufficient number of native English speakers, and utilize them to enhance the learning environments for students. About 800 ALTs first came to Japan in 1987 when the Japan Exchange and Teaching Program was launched as a state international exchange project. As of 2002, the number of ALTs had increased to about 5,600, but it began to decrease after that due to financial problems. The current number is about 4,100. Besides ALTs on the JET Program, about 8,000 ALTs hired independently by municipalities and other organizations have been dispatched to local primary and middle schools across the nation. In some cases, an ALT teaches at several schools. According to experts, considerable disparity exists among the nation’s 21,000 public primary schools. While some schools have resident ALTs, some schools are visited by an ALT once about every six months. The government therefore plans to increase the number of ALTs in the JET Program in stages. From the 2020 school year onward, English lessons will increase from the current once a week to three times a week for fifth-grade and sixth-grade students. 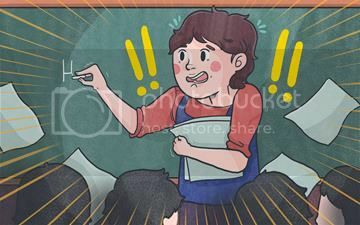 Third-grade and fourth-grade students will have English lessons once or twice a week, and the education ministry plans to have ALTs frequently instruct students in English classes. The budget for English education utilizing ALTs is expected to increase from about ¥30 billion this school year to about ¥50 billion a year eventually. The government also plans to launch a subsidy system for supporting municipalities that independently hire ALTs. An ALT assists Japanese teachers in teaching foreign languages such as English at primary, middle and high schools. In addition to ALTs who come to Japan on the Japan Exchange and Teaching Program, a state international exchange project, others are directly hired by municipalities or private organizations contracted to dispatch ALTs. From the 2011 school year, foreign language studies became compulsory for fifth-grade and sixth-grade primary school students. The role of ALTs has expanded to include assisting with pronunciation and listening comprehension. Added on September 10, 2014 by JETAA Southeast. Consulate General of Japan in Atlanta is seeking an Official driver for consulate staff. Candidate must be a U.S. citizen or a U.S. green card holder. Limousine and/or chauffeur experience preferred. If accepted for an interview, please be sure to bring your original documentation. Once selected, candidates must be willing to submit to an FBI background check. The Embassy of Japan in Washington, D.C. Wants to Hear from you! Added on September 3, 2014 by JETAA Southeast. The Embassy in DC has created a JET Alumni survey to collect feedback on everyone's experiences in the JET Program. It doesn't matter if you just returned home this year, or if you have been home for 10 years. If you have a few moments, please take the time to fill this out. We will be sending the data back to CLAIR in hopes of changing problems that may exist. Added on August 31, 2014 by JETAA Southeast. Want to help aid Japanese disaster victims? JET Alumni Association of Northern California is recruiting people interested in helping to develop and administer a new JETAA-AJET Disaster Assistance program. As the recent landslides in Hiroshima sadly attest, many natural disasters occur across Japan every year, including nearly 1,200 landslides. The program would mobilize in a simple way the over 50,000 JETs and JET alumni around the world (and their extended networks) to assist Japanese communities in their time of greatest need. Want to do something right now? Donate to help disaster victims in Hiroshima! 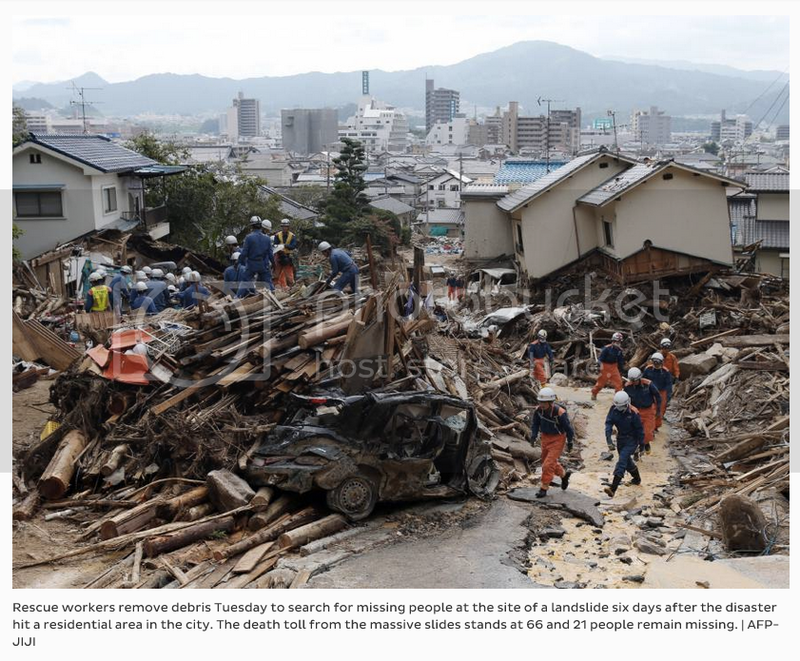 The death toll from mudslides in the city of Hiroshima jumped to 71 last Wednesday, with at least 15 people still missing. Nearly 1,000 people out of about 1,300 evacuees are sheltered in nine local elementary schools. Hiroshima Kenjin Kai of Southern California has formally joined the efforts of Hiroshima Prefecture and various Hiroshima-based NGOs and NPOs in the effort to raise funds in support of the victims of the disaster that befell the local community and residents of northern Hiroshima. This fundraising drive will be carried through the end of September (September 30, 2014). All funds collected in this drive will be sent to Japan Red Cross Hiroshima Office for distribution to the disaster victims. For any inquiry, please contact Dr. Charles Igawa, HKSC Secretary via email at icigawa at gmail dot com. Added on August 23, 2014 by JETAA Southeast. If you're not subscribed, here's the latest from AJET - natsukashii, ne! Welcome to your home, new JETs! Now that you're settled in, AJET is here to help you with the next steps. Check out an awesome article by our own Verity Lane of Hokkaido on "how to ALT"! Be sure to read the After Tokyo section to learn what to do in your first month and beyond, too. Credit for image and original article goes to Tofugu. AJET Block 3 is jointly hosting the JALT Conference in Nagano on August 30th and is inviting all of AJET to join them! As JET participants, we will all receive a 50% discount on the registration fee. Can't make it to this event? No worries! Stay up to date with everything happening around Japan with the National AJET events calendar. Have you had a chance yet to learn about your National AJET representatives? Learn who your Block Representative is, and read about how they are serving our community on the AJET National Council by visiting the AJET website. They are always here to listen, so keep in touch and feel free to contact them if there's anything you need help with! National AJET is proud to present a welcome video for new JETs, made in collaboration with AJET organizations across Japan. Subscribe for more exciting YouTube updates from National AJET as our channel kicks into gear. Upcoming videos include one for JETTeach, a series on ALT teaching, and an installment of the JETLife series, which deals with the common idiosyncrasies of life as a JET. If you have any inquiries about these, please feel free to contact AJET Chair Sandy Cheng. What has AJET been up to? Massive overhaul of ajet.net is in the works! Download the latest edition of Connect Magazine here!